Cleftlanders in attendance: Cadfan of Cleftlands, Laurel of Cleftlands, Gladius the Alchemist, Caitilín inghean Néill, Garvin the Slow, Muldonny McVriw, and Gwyneth Cole. 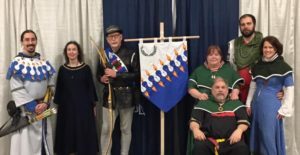 On March 30th, the Barony of Sternfeld hosted the event Better War Through Archery in Danville, IN. A select group of archers traveled westward to participate in the biannual Schutzenfest, one of the premiere archery tournaments in the Kingdom where the winners of each of the three divisions (handbow, crossbow, and period bow) win an ornate popinjay necklace to wear for six months. The winner for handbow is Forester Gwyneth Cole, second place is Forester Muldonny McVriw. The second place for the Period division is Forester Gladius the Alchemist.